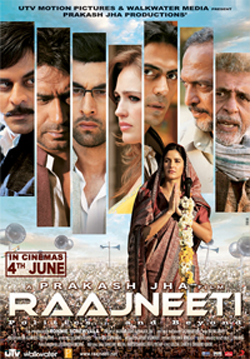 Prakash Jha's 'Raajneeti', riding on the aura of India's First Family in politics, has been bringing in the crowds in a manner that recalls a pre-multiplex, pre-popcorn era, when audiences actually thronged the single-screen cinema halls and catcalled or whistled from the front stalls. It is the popularity that the film seems to enjoy that demands a deeper engagement with it. If 'Raajneeti' had sunk without a trace, what it seeks to project and portray would hardly have mattered. But in the full splendour of stereophonic sound and 70 mm breadth, with Sachin Krishn's lenses capturing the heat and dust of un-named, but distinctly heartland, India with great verisimilitude, and Jha himself appearing to be a Coppola on speed, it becomes important to hit the pause button and reconsider the film. All the more because the film's audiences defy definition - 'Raajneeti' has won enthusiastic reception across the spectrums of class and region. It has done well in both metropolitan India and small town India; in the peninsula and among the diaspora. So the question: Is this extraordinary success a public endorsement of the view that Indian democracy is a hollow, feudal and corrupted thing; that it is just an elaborate charade to hoodwink the great unwashed of this vast land? Because that, decidedly, is the central message of the film, going by the unsavoury array of blood-thirsty politicians it showcases. Its heroes behave like villains, and its villains occasionally conduct themselves like heroes, but both categories think nothing of blowing up the cars that carry their opponents - making it look as easy as dialing a number on a mobile phone! They bludgeon their enemies with baseball clubs, hurl blood-curdling abuses at each other, yowl for revenge or quietly conjure up situations that Genghis Khan may have done at a particularly clairvoyant moment. In the 'Raajneeti' version of Indian democracy, elections exist to bring the already powerful to power once again. Their verdicts are decided by controlling officials and by manipulating electronic voting machines. In the process, the 714 million voters of the country have been reduced to a pastiche of faces, mere dusty hoards watching helicopters land, running widely through village bylanes or screaming approval of what a khadi-clad leader pronounces from the stage. The political stage, incidentally, is always dramatically projected as larger than life by Jha, perhaps to symbolise the overweening presence that politics has in the life of the country. This is not, of course, to say that there is nothing in the film that recalls contemporary politics in India. No one would dispute that the political malevolence portrayed in 'Raajneeti' is not present in today's India. But it is certainly not the whole reality. And there lies the conundrum. The film's treatment is disturbing precisely because it presents itself as a credible representation of Indian politics as a whole. It does this by cannibalising bits and pieces from events that are still fresh in living memory - for instance, images from the funerals of Indira Gandhi and Rajiv Gandhi - and mounting them so cannily as to appear faithful to the original. Such ersatz reality is used to devastating effect in the film's portrayal of women in politics. Here you have the Katrina Kaif figure clad in saris, waving to crowds, climbing on to the political dais and speaking into mikes in close mimicry of a Sonia Gandhi. But if one were to go by the 'Raajneeti' narrative, women exist in Indian politics only to consolidate the power built by patriarchal and feudal forces and have no agency of their own. Indeed, women can only merge in the political arena in one of three ways. First, by allowing themselves to become puppets in the hands of the men who control them and who decide when and how they should make their appearance before the public - as in the case of Indu Pratap Singh, played by Kaif with her oh-so-Sonia mannerisms. She is buffeted around thanks to the machinations of her recalcitrant boyfriend and the ambitions of a wealthy father. Second, by prostituting themselves like the female politician from Sitapur, played by Shruti Seth, who wears her sari pallav on her sleeve and spends her free time shopping in malls. The lady will do anything for a "ticket" to contest the elections, and she adopts her patrons and betrays them depending on who is in power. Third, by remaining behind the scenes and mothering political dynasties, steadfastly turning their backs on their own needs and ambitions, and assiduously protecting the interests of their 'legitimate', political children, much like the character played by Nikhila Trikha. In fact, it is striking that the only woman character in the film to display a spark of independent will and social concern is unsurprisingly a foreigner - the Irish-American girlfriend of the protagonist played by Sarah Thompson - who tries at least to intervene and save a woman from being abducted before her eyes. Her Indian counterparts, in contrast, just hunker down, shut their eyes to the mayhem that is happening around them, and play the roles that are assigned to them. These women are ringing endorsements of the oft-heard argument that women are essentially non-serious about politics and really have no place in Indian democracy. Which is why the question, whether the popularity of 'Raajneeti' lies in its qualities of cinematic persuasion or in its ability to faithfully mirror the popular view of politics and political women in the country, becomes important. If it is the latter case, then there are disturbing implications for Indian democracy in general and, more specifically, for women's participation as equal partners in the political sphere. Today, 17 years after the 73rd and 74th Constitutional Amendments became the law of the land, there is unassailable evidence from the ground that women have - in innumerable panchayats and municipalities across the country - become independent agents of change, articulating the interests of ordinary people. In spite of this and despite 14 years of activism over the Women's Reservation Bill, there continues to be great resistance to the emergence of women as peoples' representatives in state assemblies and the Parliament. The portrayal of political women in such a retrograde manner as in 'Raajneeti' only goes to buttress a patriarchal political status quo at a time when the Women's Reservation Bill hangs in a limbo awaiting the Lok Sabha's nod and political parties seem prepared to give it a quiet burial yet again. When the Women's Bill was passed in the Rajya Sabha in March, Lalu Prasad Yadav, the Rashtriya Janata Dal supremo, had declared that he would allow the Bill to be passed in the Lok Sabha only over his dead body. His other great comrade-in-arms in this battle, Samajwadi Party's Mulayam Singh Yadav, had even stated that the Bill would destroy Indian democracy. Today, the two stalwarts may just as well distribute free tickets to 'Raajneeti' to get their point across. It makes the same argument, and does it so much more convincingly. I am sure the author approves of he treatment of women in all of Deepa Mehta's movies.